ZECA Cachaça – (zaay-kah) www.zecadematos.com – a fine artisan cachaça hailing from the lush green mountains of Brazil’s hidden Zona Da Mata, in Minas Gerais and launched in 2016 at Harvey Nichols stores. More in ZECA: The premium cachaça is masterfully hand-crafted by the Matos family estate for over 100 years using only traditional methods: ZECA is distilled in old alambiques, directly from the once-pressed sugar cane grown at high altitude, resulting in a perfectly balanced cachaça with hints of dark wood, spice and exotic botanicals. The brand celebrates the seductive beauty of this precious gem stones region and its inhabitants, in particular the indigenous Tamandua anteaters, a natural pest control in the process of cachaça making. The name ZECA pays a homage to Joseph “Zeca” de Matos, first of the family to be born in Brazil, son of the pioneer Antonio de Matos who bravely moved from Portugal in 1891 to settle in the untamed region of Minas Gerais. With a vibrant, eye catching amethyst logo featuring the Tamandua anteater, ZECA is set to revolutionise how the cocktail scene views cachaça. 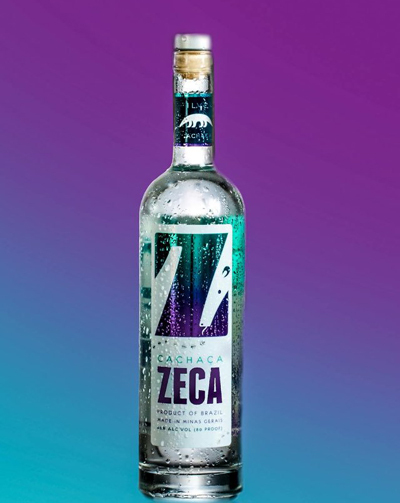 Cachaça and rum lovers are encouraged to drink it neat or over a single block of ice in order to experience the full spectrum of flavours that make up ZECA Cachaca. How to drink it: Cachaca lovers are encouraged to drink it neat or over a single rock of ice in order to experience the full spectrum of flavours that make up Zeca Cachaca. Cocktail enthusiasts can try it simply with brewed Ginger Beer or a hand-crafted Lemonade for a delicious, cocktail effective result that might rival the attention of the G&T lover. Tasting notes: A heady scent of passion fruit, banana, zesty spice & fresh sugarcane make for a wonderful palate complexity. Late notes of rich, smoked indigenous wood and that make for a finish length longer than the Amazon River. Symbols and branding: The ZECA Cachaça illustration brings to life the rich diversity and beautiful abundance of Minas Gerais gem stones producing region of Zona da Mata. Its purple colour stands for the gem amethyst. Its green celebrates the oxidised colour of the alambique copper, the most traditional cachaça distilling apparatus. The Tamanduá antieater is the brand’s most lively character, a natural pest control who roams the sugar cane fields at night eating the ants. Every element is authentic and can be cropped in any way, can be used as a background, wallpaper or watermark.